Tamara Hensick's playful, pewter paperweight make a home-run gift for the baseball fan. He's safe! And so are all of your important office documents. Tamara Hensick's playful paperweight is the perfect gift for a baseball fan, sports enthusiast or anyone with a love of the game. Handmade of lead-free pewter in Los Angeles, California. Approx. 4.75" L x 2" W x 1" H; 5.2 oz. We ordered this as a gift for a friend/business acquaintance who just moved into a new office. We wanted to mark the occasion by giving him a gift that means something to us. 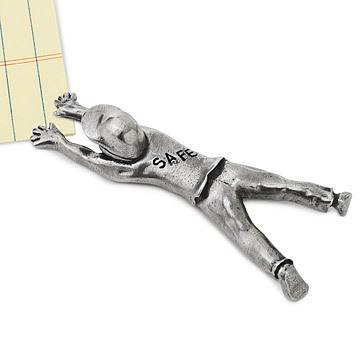 We've always told him how he has helped us feel "SAFE" about our future, so this little paper weight is perfect. Only criticism is the same as a previous reviewer, that the word "SAFE" is not darker as shown on the website and therefore does not stand out. We took care of this by using a black ultra thin permanent marker to darken the grooves and now the word "SAFE" jumps out at you, which was our intent. We are very pleased with this purchase. Really unique but overpriced. Bought it anyway. This is so incredibly cool, unique, and perfect for my baseball-loving brother-in-law. The paperweight can be functional on a desk or bureau or as a decorative piece on coffee table or shelf. It's a great conversation starter. My sister hasn't received this gift yet but I'm sure she will love the uniqueness of it. On a busy office desk, keeps items in place. perfect gift for my son who is a teacher and baseball coach! We gave this to our son for his birthday. He is a middle school baseball coach and special education teacher! It's perfect for his desk.